We recently requested prayer concerning the detention of 34 people for alleged involvement in violence in which 26 protesters and one soldier were killed. The violence occurred in Cairo on October 9, when demonstrators marched in protest at the authorities' lack of action to prevent the destruction of a church building in Aswan. The protesters were mainly Christians but also included some Muslim sympathizers. Egypt's National Council for Human Rights reported that 12 of those killed died of injuries sustained while being run over by armoured vehicles. Middle East Concern reports that, of the 34 detained, all but one have now been released. Six were freed after initial investigations. A further 27 were released on December 15 after a judge accepted an appeal to revoke the prosecution's recent decision to extend their detention for another 15 days. Most of those released are Christians. Christian leaders, among others, continue to call for the release of the final detainee, Alaa Abdel Fattah, a Muslim, who has been detained on multiple occasions for speaking out against the former regime and the army. Those recently released will know the presence and peace of Jesus as they resume normal life. The remaining detainee will be released. The truth concerning events of October 9 will become known, and those responsible will be brought to justice. Those bereaved, wounded and/or traumatized will know the comfort, healing and restorative touch of Jesus. 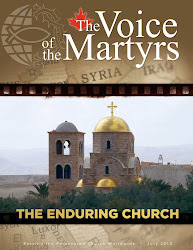 For more on persecution in Egypt, click here.